World of Tanks Generals was a free online card game dedicated to the battles of World War II. It included more than two hundred cards with a set of unique features, allowing players to use a lot of tactics on the battlefield - from a massive offensive to sudden lightning attacks and protracted trench warfare. 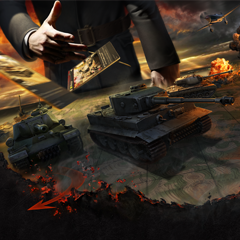 On April 15, 2016 Wargaming announced that development for World of Tanks Generals had ceased. The servers were shut down a year later, on April 15th 2017. Dernière modification de cette page le 9 octobre 2017 à 12:02.